those prefs look like a screaming buy. Or something? 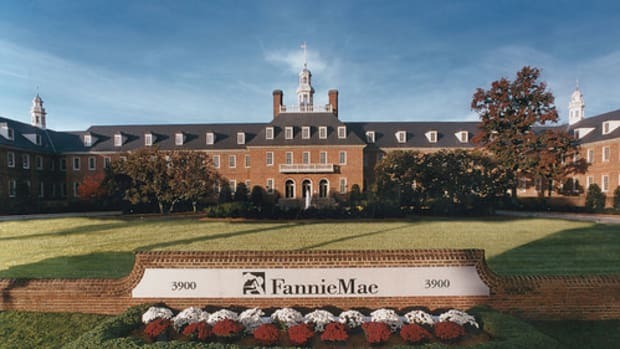 Per the Journal, "Paulson & Co. and Perry Capital LLC are among a handful of hedge-fund firms that have bought so-called preferred shares in Fannie and Freddie." They&apos;re selling at ~18-20 cents on the dollar, which I suppose reflects a, what, 30% implied probability that they get turned back on in the imaginable future?1 Does that sound like, um, this? "To the degree these guys are placing a political bet, it is one that faces unimaginably long odds," said Jim Parrott, who served as a top housing-finance adviser in the White House until the end of last year. Freddie and Fannie remain political pariahs, with few signs pointing to any political will to resurrect the firms. Sen. Bob Corker (R., Tenn.), who is working on a bill that would replace Fannie and Freddie with a new structure that would leave no room for private shareholders, said he sees the preferred shares as little more than a "lottery ticket." “I’m not aware that there’s ever been an instance in 200 years where equity shareholders in a company that’s currently profitable were forced to take 100% losses,” says Rob Zimmer, a former Freddie Mac lobbyist who has his own government-relations practice. Another good rule of thumb is that when you say "never been an instance in 200 years," you&apos;ve probably gone astray. The basic argument seems to be that, as Fannie and Freddie make more money due to a benign market and massive DTA write-ups, they will return more of that money to Treasury, until pretty soon Treasury will have made a healthy profit on its Fannie/Freddie bailout and so will feel more favorably inclined to the Fannie/Freddie (preferred) equity holders whom it shafted in 2008 (including lots of wee banks who thought they were government guaranteed), or the hedge funds who&apos;ve purchased their positions. Or, if Treasury does not feel so favorably inclined, Congress or the courts might feel more sympathetic. This is also Hank Greenberg&apos;s theory, re: AIG, and how&apos;s that working out for him? An odd thing about Fannie and Freddie is that though they live a horrible nonsensical zombie existence that everyone says is terrible, it nonetheless works out pretty perfectly for everyone involved. Fannie and Freddie get to bop along in conservatorship, doing their Fannie and Freddie thing of guaranteeing mortgages and stuff, secure in the knowledge that their mortgage guarantees are backed by the full faith and credit of the United States government3. Their bank customers get to make big safe profits by selling them mortgages. Their security-buying customers (including, mostly, the Fed) get the safety of that implicit government guarantee made all the guarantee-ier by their conservatorship status. Treasury gets to use them as a way around the debt ceiling, with Fannie issuing billions of dollars of (implicitly Treasury-guaranteed) debt to pay dividends to Treasury to pay off (explicitly Treasury-issued) debt.4 The government could, if it wanted, use the government-controlled Fannie and Freddy to push housing policy, though it mostly doesn&apos;t. Congress gets to have hearings and yell about them. A system with no Fannie and Freddie, or a purely private Fannie and Freddie, would be worse for all of those people, wouldn&apos;t it? Even a return to pre-2007 Fannie/Freddie - "private," implicitly government backed, equity in private hands - would seem Pareto pessimal for all of them. Except for the equity holders, who might get some money back. But why would they get a say? Lately, more small investors also have begun to pile in, a trend that is "somewhat unsettling," said Isaac Boltansky, a policy analyst at Washington-based Compass Point Research & Trading, a dealer-broker for institutional clients. A preferred that just bops around forever on hope always has a chance of being sold to the greater fool. 1.Fake math! Note that FNMA&apos;s 8.25% seem to have last traded at $6.05 (~30% on this math), FMCC&apos;s 6.55% at $4.65 (29%). Also btw casual perusal suggests that these things trade a multiple of the volume traded by the actual dividend-paying preferred stocks of actual alive big banks, so while it&apos;s not like billions of dollars of them have changed hands this year, tens or hundreds of millions have. 2.These days you could say the same about John Paulson OH SICK BURN. We alone are responsible for making payments under our guaranty. The certificates and payments of principal and interest on the certificates are not guaranteed by the United States and do not constitute a debt or obligation of the United States or any of its agencies or instrumentalities other than Fannie Mae. How valuable is a guarantee backed only by a company in receivership with a maximum net capital of, essentially, zero? Very valuable is the (counterintuitive) answer. 4.More could be done on this point, if Treasury was a bit daring.